I concur with all other reviewers here. As a seasoned audiophile ive been there and done that, starting in 1983 with the very first CD player. The listing of all CD players owned would be boring to a point. There were technically brilliant ones, there were tube based CD players, there were atom clocks, big separate powersupplies, and some players that costed double or even quadruple the REGA ISIS. My personal sample was aquired through a certain trade path, and was supposed to go on sale right away. The thought of REGA company actually putting out such a brilliant CD player never even crossed my mind. REGA makes very nice turntables for little money right? Now i've been spinning Vinyl since 1970 uninterrupted, and next to the ISIS is one class act turntable which is tuned out to the max. Mind that i love CD just as much as my substantial Vinyl collection.i'm no CD hater nor Vinyl lover kind of audiophile, i love any records, i love music. Well to get to the point, the ISIS is the first CD player which to my ears sounds like Analog. And i would never thought of saying that. Yes it get's totally under your skin, and no it is not polite, it is not warm and rosy. Vinyl is not like that. There is no warming up, no golden sound to mimic Vinyl. Because Vinyl does not sound like that. And the people at REGA know. Please do take care in supplying the very best cables you can afford, the ISIS shows in a big way. In that way it is just like any other highend gears. Wrong cables equals bad sound here too. If you love Vinyl, you will love REGA ISIS. Actually i was planning to spend a silly amount on a new Japanese SACD player, but the ISIS is here to stay... The difference buys me a truckload of records, be it CD or LP. Build quality, use, remote, packaging, there are some much more costly players which cannot even touch this level. Call me impressed, and REGA can take that as a compliment indeed. The Isis is a very fine CD player indeed. I have owned a Rega Saturn before for three years but could not find myself at piece with it. While the Saturn has a Rega sound it misses the complete natural sound that most Rega gear has. But to my opinion some way of unnaturalness is something that a lot of CD players are missing, also of other brands. The Isis is like comming home again. It sounds completely natural and has a fantastic musical flow. I absolutely love the natural midband. The Isis gets under your skin. When i am away from home at times i cannot wait to get home and play CD's. This CD player makes me forget i am listening to a CD player. I use all Rega gear with on the turntable side a P7, Apheta and IOS. The Isis i highly recommend for Rega lovers. But although build like a tank, without compromises and with lifetime warranty, unfortunately it the Isis is a very expensive CD player. I think other Rega gear offers better performance to cost ratio. But that also is the only catch i can think of. Before the Saturn i owned the "good old" ribbed case model of Jupiter and IO. The owners of these old Rega line CD players for sure will love this Isis. By coincidence (?) the Isis also uses Burr Brown DAC's like Jupiter/IO and Planet at that time did. I dont believe CD players can sound like analog. The thing any device should do is that it should make you forget that you are listening to reproduction. The Isis does this and definately also has a lot of qualities that you can hear. 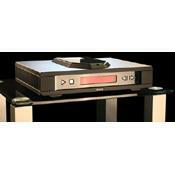 A superb CD player from Rega, which is more known for budget-conscious stereo equipment that offers outstanding value. Well, it's no different here. Rega is still offering great value in a high-end CD player. The Isis is their spare-no-expense, all out compete with CD players costing much more. Rega fans will probably be shocked by its $9,000 price tag. But once you start looking at one, you'll be impressed right from the get go, starting with the massive crate that it comes in. Forget the ordinary cardboard packaging you get from most other manufacturers. The Isis is heavy (over 40 lbs) and built like a tank. Its remote is shocking too. It could easily double as a billy club. I've felt remotes from CD players costing more than double the price of the Isis. They just felt like ordinary, cheapo remotes you'd find with most consumer-grade CD players. As one online reviewer stated, companies producing CD players costing in the $20-50K stratosphere ought to be very worried about the Isis. over 20MB of memory with 32-bit digital processing. 10 separate power supplies in the analog and digital circuits. What does all this mean you ask? An excellent, smooth sound with great clarity that reminds you of the best of analog reproduction. Not that you will retire your turntable, but you'll once again want to revisit your entire CD collection to listen for detail you may have missed or never heard before. For those who have digitized their music collection, you can use the Isis as a USB DAC. Connect your computer to the Isis through a USB cable and play all your digitized music through the Isis. I purchased the Isis along with the Osiris, their integrated amplifier and am running in full-balanced mode. The Isis will absolutely be the last CD player I'll ever own.